Dye Remover Poisoning is the accidental or intentional intake (swallowing) of any product containing the compound. The substance may also come in contact with the skin or eye and cause irritation and associated symptoms. What is Dye Remover Poisoning? What are the Causes of Dye Remover Poisoning? The chemicals in dye stain removers may include sodium hydrosulphite and sodium hypochlorite, detergent compounds (such as sodium tripolyphosphate, tetraborate, and percarbonate), hydrogen peroxide, acetone, citric acid, boric acid, sodium and potassium hydroxide, glycerine, etc. What are the Signs and Symptoms of Dye Remover Poisoning? The signs and symptoms of Dye Remover Poisoning can vary from one individual to another. It may be mild in some and severe in others. It also depends upon the nature of the chemical compound. Several systems of the body, such as the respiratory system, digestive system, vascular system, skin and ENT, may be affected. How is First Aid administered for Dye Remover Poisoning? Who should administer First Aid for Dye Remover Poisoning? 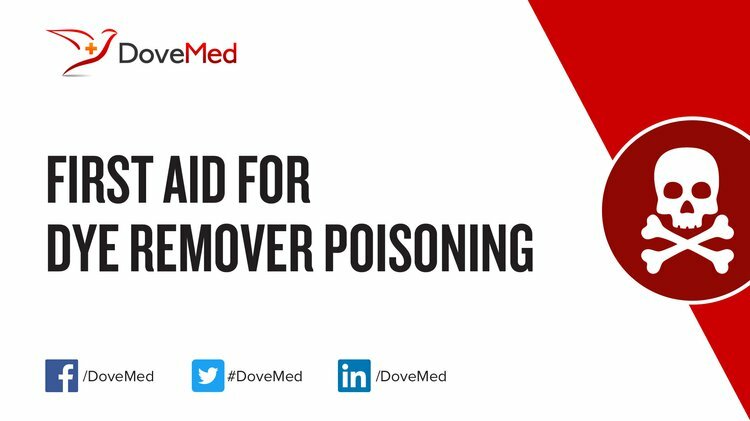 First aid for Dye Remover Poisoning is administered by healthcare professionals. What is the Prognosis of Dye Remover Poisoning? How can Dye Remover Poisoning be Prevented? Gottlieb, A., Shaw, C., Smith, A., Wheatley, A., & Forsythe, S. (2003). The toxicity of textile reactive azo dyes after hydrolysis and decolourisation. Journal of Biotechnology, 101(1), 49-56. Reife, A., Reife, A., & Freeman, H. S. (Eds.). (1996). Environmental chemistry of dyes and pigments. John Wiley & Sons. Crini, G. (2006). Non-conventional low-cost adsorbents for dye removal: a review. Bioresource technology, 97(9), 1061-1085. Bhattacharyya, K. G., & Sarma, A. (2003). Adsorption characteristics of the dye, Brilliant Green, on Neem leaf powder. Dyes and Pigments, 57(3), 211-222. Naresh, D. T. V., Rajashekar, K., & Rohini, M. (2015). KEYWORDS: Poisoning, Organophosphorus, Hair colour, Herbicide, Clinical profile. PROFILE OF POISONING CASES IN A TERTIARY CARE HOSPITAL, TELANGANA, INDIA, (1049). Eddleston, M. (2000). Patterns and problems of deliberate self‐poisoning in the developing world. Qjm, 93(11), 715-731.